Will the world be saved, or will the fate of the world take a darker turn? To see what turn is taken, I’ve been joined author G. Sauvé, to explore the world of The Nibiru Effect. Let’s start our chat today by setting up our understanding of this world by sharing how this book started. It started with a planet. Nibiru—sometimes referred to as “Planet X” or the “Red Planet”—is said to be a large astral body that passes through our solar system every 3650 years or so. Its existence has yet to be scientifically proven, but many are those who claim Nibiru is on a collision course with Earth. Whether this is fact or fiction remains unknown, but I found the concept quite intriguing. I pondered it for a while before it finally dawned on me that the cyclical nature of the Red Planet’s trajectory in relation to Earth made for the perfect premise for a time travel story. After that, everything fell into place. Well, sort of. It took me five years to flesh out the story and outline the eleven books in the series, but, finally, I get to share my story with the world. Five years is a significant amount of time to spend on a story. Did you find that your love of this tale kept your energised over this period, or did it ever get a too much and exhausting at times? Both. When I start the day and the words just flow out of me, I feel alive and lose all track of time. I eventually emerge from the trance, exhausted and dreary-eyed. Other times, I can’t seem to focus and I end up rewriting the same paragraph a dozen times. On those days where you easily fall in the writing trance, what do you tend to think about as you write? Everything and nothing. I usually focus on the characters and the story. Everything else just sort of fades away. As you’ve kept committing yourself to these writing sessions over the years, do you feel like your writing has changed? When I first started working on this series, I was like a kitten. Cute and clumsy. Now, I’m more like a tiger. Ferocious and unyielding. But that doesn’t mean I’m done evolving. There’s always the next level. *Laughs* I love the idea of a tiger writer! Has this ferocious and unyielding attitude also lead you to start thinking about how you’ll brand your writing? To be perfectly honest, I spent very little time on branding. I just tried to write the best story I possibly could and hoped people would like it. Of course, now that my book is published, I wish I would have planned better, but making mistakes and learning from them is part of life. I don’t regret anything. It’s hard to regret if you learn so much. What is the most important thing you feel that you learnt from getting this book published? There were so many. Because of the time travel aspect, I had to plan every single book in the series before writing it. By the time I got to the last book, the story had evolved so much I had to go back and rework the first ones. I did this three times before the story was developed enough I was confident I could begin the writing process. But that doesn’t mean I’m done learning. Far from it. Looking back on the writing process of this book, what do you think was the central idea you wanted to share with readers? Honestly? I was so focused on getting it done I didn’t even stop to think of what I was trying to say. I just hope people enjoy it. I hope they do too! And if the readers do find they love the books, can they be assured of more of your work to read? This series is all I have time to work on. With 11 planned books in the series and such a tight schedule (I would like to publish 3 books each year), I don’t have time for much else. Of course, I have a bunch of ideas for other series, but they’ll have to wait until I’m done with Will, Jonn, and Kara. Do you remember how you first met Will, John and Kara? I don’t actually recall. Will started off as a younger version of me. Kara started as a love interest for Will, but she soon grew into much more. Jonn, well, I always wanted to write a wise-cracking, brutish character that is so stereotypical you can’t help but love him. The rest sort of just came to be out of necessity. Did the lives that Will, John and Kara lead ever feel like they were inspired, at least in part from events from your own life? You could say that. When I first started working on this series almost six years ago, I was a complete newbie when it came to writing, so I created a writer that was just like me. As the story evolved, so did Will and the other characters, but I always picture myself in the character’s shoes and try to figure out how I would react if I were in that situation. I guess you could say every character has a little part of me inside them. I’m so glad to hear that you’ve all grown together and hopefully had a lot of fun along the way. One way I like to keep the fun alive is to delve into some unexpected questions, so let’s see what we can do today in that arena with some fun questions like, uf money doesn’t grow on trees then why do banks have branches? So those with the most drive can climb to the top. *Laughs* Sounds like a good plan to me! Can you cry underwater? It’s hard to tell the tears from the sea, so we’ll take your word on it. If space is a vacuum, who changes the bags? Of course! Why is a square meal served on round plates? That’s a pointed question. Kind of like a triangle. Hey, that’s shape! Coincidence? You tell me. Nothing is ever a coincidence! What is your favourite word? Octopus, because it’s the first word that popped into my head. He starts to sparkle, for some unknown, Twilight-esque reason. Hopefully, that sparkle can be washed off. Are you left or right handed? Am I right-handed? That’s right. Hey! I just made a pun. Cool! Not a bad pun attempt, but let’s see if we can do better with the next question if you could breed two animals together what new animal would you create? A turger, which is a half tiger, half turtle beast. Why? Because they’re my two favourite animals, of course. Now a turger sounds punnier! We’ve had a lot of fun discussing writing and even some of the quirkier ideas that pop-up into your head, but can you bring it all together now by sharing your favourite line from this novel? It’s not a jump. Nor is it a fall. It’s a cross between the two. I think I’ll call it a jull. No, a famp. You know what? It doesn’t matter. Call it whatever you like, it won’t change the fact that I’m about to die. Will that fact turn out to be correct? To find out dear readers, you’ll have to pick up a copy of The Nibiru Effect today! Excited to read the book we discussed today? Find it here on Amazon: ‘The Nibiru Effect ( ASIN: B07MTP4J8N )‘. 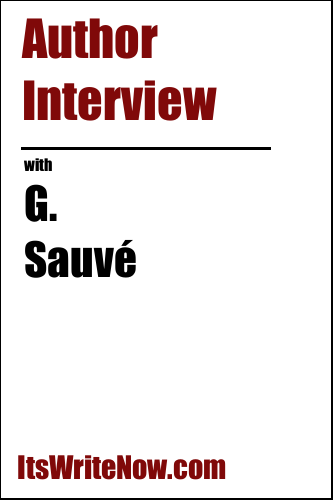 Want to find out more about G. Sauvé? Connect here!